A page from the Royal Gazette of Jamaica, dated 4th May 1781. 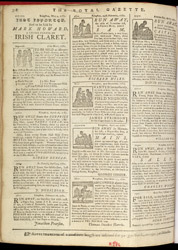 This issue features some advertisements publicising runaway slaves, in some cases with rewards offered for information or the return of the 'offenders.' Running away offered the chance of a literal escape from the slavery system and was one of the few ways in which slaves could actively resist their commoditisation and the status quo.